Bryce Haymond of Blackpool Creative has created a set of high resolution 3D renderings of the "iPhone 5" based on the circulating part leaks and diagrams. Besides the video below, he's also created a zip of 76 high resolution images for download. The numerous part leaks have fueled interest in this longer 4" screen iPhone design. Last year, early 3rd party case designs had suggested an even more dramatic redesign, but that design never came to pass. Apple will be taking the stage at WWDC next week, but most observers don't expect Apple to unveil the new iPhone at WWDC. The new iPhone is not expected to be introduced until the fall (September/October). 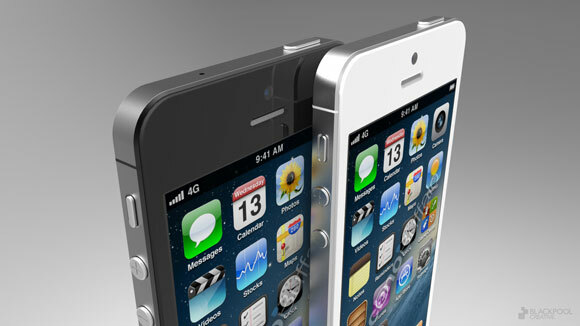 If the iPhone 5 does have a larger screen I REALLY hope it's not just an elongated screen. Well knowing that this is a rendering that could be 100% fake, I will be disappointed if the next iPhone has a design that is extremely similar to the iPhone 4/4S. There's only so much you can do...it's either taller, wider or thinner. A tear-drop shape is not happening. Apple can only redesign the iPhone to a certain extend. I personally still like the iPhone 4 design and it's hard to fault it. People expect a redesign just for the matter of redesigning something. I love my white iPhone, but if the back looks like that, I'm going to have to get a black one. All I can say is I will not buy the iPhone 5 or anymore iPhone proceeding that unless it is a redesign. In particular the "tear drop" design. I'd prefer not. The current design makes it super easy to sit it on its side or bottom for video recording or skype video chats. I like it. But I'm pretty sure that lot of people won't like it. Leaks say it's on the bottom. What if the new tall screen is for a new layout on the next version of iOS?.. It does not make any sense to me to add that screen space just for an extra row of apps.. I am just gonna put it out there... I bet the front will not be as raised as the renderings show. Right now the 4/4S have the glass slightly extended outwards. I can't see them only having that on one side as depicted by the renderings. They'll use the thinner glass, while using the elongated form factor, my best guess. If so, It'll look pretty slick. The back design... Will probably grow on me (and the rest of us) if it's the legit final design. Whatever they have to offer, the masses will love it. Look at last year... Ridiculous. This phone is not happening. 1) Too many leaks. Waaaaay too many leaks for an Apple product. They're a decoy leading us up the garden path, just like the so-called teardrop-shaped iPhone 5 last year. This many leaks just don't happen. 2) Tim Cook recently said in his D10 interview that one of Apple's key strengths with the iOS environment is the lack of fragmentation and specifically mentioned the fact that there aren't heaps of different resolutions for devs to have to code for as a key strength. Why would he say this and then undo it just a few months later.